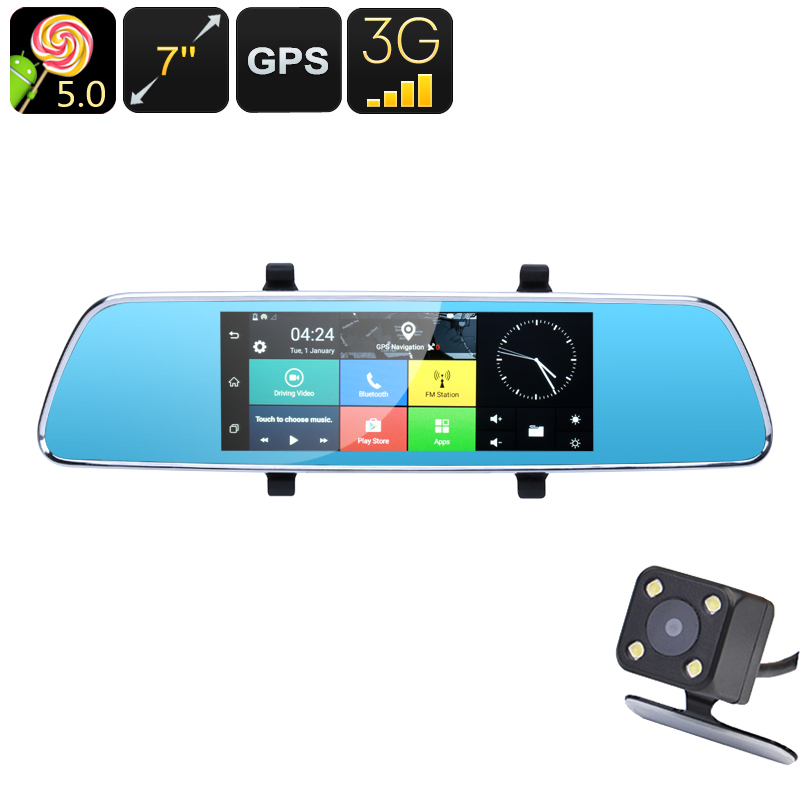 Successfully Added Full-HD Rearview Mirror Car DVR - 7 Inch, Android 5.0, GPS, Dual Camera, 3G, Quad-Core CPU, Google Play, G-Sensor, Built-In Mic to your Shopping Cart. This 7-Inch car DVR always shows you what’s happening around your car. Coming with a front and rear camera, not a single movement around your vehicle will stay uncaptured. The display of this car DVR has been built in a rearview mirror. Thanks to this, the little gadget gives your car a modern look. If you are looking for a way to pimp up your ride and increase your safety on the road, this dash cam is perfect for you. Its front camera records all that happens in front of your car in sharp 1080p resolution. Additionally, the rear parking camera will assist you in driving backward by clearly showing what’s happening behind your car. Both cameras can be used to record simultaneously. What sets this dash cam apart from other car DVR systems is that it features an Android operating system. With Google Play installed, you will be able to download media straight onto your mirror display. It comes with a touch screen which makes it easy to navigate. Additional 3G support allows you to browse the web at any time in your car. Thanks to this, you’ll always be able to stay connected to friends and family even while you’re on the move. With 16GB internal memory, there is plenty of space to store your recordings. For those of you that need more memory to store media, it features a 32GB SD card slot. Besides recording all that’s happening around your car in crisp 1080p, this car DVR also features a 66 channel navigation system. With this GPS at your side, you’ll never get lost again. From now on you’ll always reach your upcoming destination in the fastest and most efficient way possible. Internally, this car DVR player holds a Quad-Core CPU and 1GB RAM. With this hardware, it’s capable of handling all basic mobile features. Its front camera features a large 140-Degree angle and 1/4-Inch CMOS sensor. Thanks to this, you’ll be treated with crisp wide-angle recordings. Its parking camera furthermore delivers 480p video of all that happens behind you. This allows you to easily park your car backwardly without needing to worry about bumping into any objects. Featuring a G-sensor, this car DVR will recognize the moment of a potential impact and instantly store all your saved footage. Like this, you can be assured that you’ll never lose an important piece of evidence. This car DVR comes with a 12 months warranty, brought to you by the leader in electronic devices as well as wholesale electronic gadgets..